Last night I the distinct pleasure of seeing B.J. Novak, actor and writer on "The Office", perform his stand-up comedy routine in front of a sold out crowd here at Ohio University. Oddly enough, this performance was during OU's quarterly 'Parent's Weekend', and sure enough, there were a ton of them in attendance. Luckily, Novak didn't make any attempt to tone down his act, which the majority of the crowd appreciated; I didn't see anyone walking out (the university did post signs at the entrance warning about 'controversial material'). Novak's standup comedy was at once sarcastic and endearing. One of his better bits was about a childrens' book he is purportedly writing called "Wikipedia Brown", a modern update of the classic "Encyclopedia Brown", in which Wikipedia merely hinders the solving of a crime because of the distraction his wealth of information provides. One odd bit that didn't really do much for me was the one you see pictured above. Novak introduced the audience to his friend 'Shy Puppet', whom he respects enough to not force him to speak as so many ventriloquists often do. To be fair, I think Novak realized how cheese-y this joke was, which is why he let the audience take pictures of him and the puppet, just so Facebook would be flooded with photos of Novak doing his best Jeff Dunham impression. Novak also elicited some crowd participation by reading off a series of one-liners he'd been working on, and throwing away the ones the crowd reacted negatively towards. One the best of the worst of the rejects: "I saw this guy yesterday drinking some water with cubes of frozen water in it. Man, that guy loves his water". After concluding his routine, Novak took some questions from the audience. My favorite moment was when he spoke a little about his experiences on the set of Quentin Tarantino's newest film Inglourious Basterds, in which he has a supporting role. He said that it's already looking like a classic Tarantino movie, and that Brad Pitt's performance is amazing. As someone who's eagerly awaiting this film, this is all very good news. Another memorable moment was when someone within the audience asked why he "wasn't this funny on The Office", to which Novak responded that he would take that as a compliment to his stand-up performance. He was a pretty interesting guy, obviously a driving force behind what makes "The Office" such a great show. Props to OU's Programming Committee for bringing someone this cool out to our neck of the woods, and could I suggest that a Q&A with Kevin Smith (preferably not during Parent's Weekend) be next on your list? 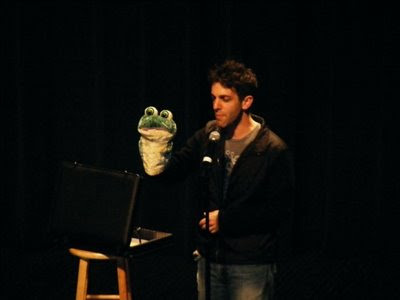 I thought BJ Novak was in a relationship with the Ohio Lottery reindeer puppets.